What Happens In A WI Pharmaceutical Class Action Case | Hupy and Abraham, S.C.
A class action lawsuit of any kind is one in which a group of people have become ill or suffered similar injuries. These injuries or illnesses can often be traced back to a defective product—and in the case of pharmaceutical class actions, they can be traced back to a certain drug or medical device. Your story, though one of hundreds, has the power to reach big drug companies and send a message: We have been injured by your mistake and we will be compensated. Class actions are useful for many people have been hurt. However, your time to file, or to join, a class action lawsuit is limited. Accordingly, we encourage you to learn more about how class action cases work in Wisconsin and to contact an attorney today at 1-800-800-5678 to discuss your rights. What a class action case is and how to get started. Class action cases may be financially beneficial and may allow you to pursue a claim that you could not otherwise pursue. However, before a recovery may be made, you must follow the rules for filing a class action case in Wisconsin. The role of the lead plaintiff and the rest of the class. Lead plaintiffs have certain responsibilities, but all plaintiffs in a class action have the right to recover damages. How to find a pharmaceutical class action attorney. Before you hire an attorney, you should find out how to choose a lawyer for this kind of case. What to talk about with your class action lawyer. In order to recover damages, you are going to have to prove a case for which the court can legally grant you relief. Thus, it is important to share specific information with your attorney as soon as possible. What happens if you were hurt by a generic drug. There are different things to consider when pursuing a class action case for harm done by a generic drug rather than a prescription drug. Whether you have standing to sue. 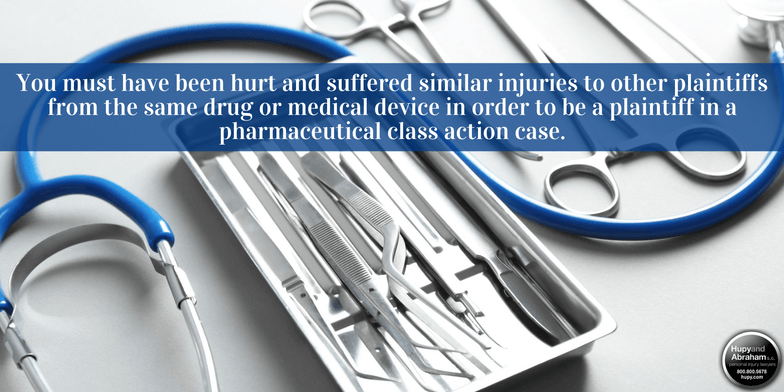 You must have been hurt and suffered similar injuries to other plaintiffs from the same drug or medical device in order to be a plaintiff in a pharmaceutical class action case. How long you have to sue. The time that you have to sue is limited by the statute of limitations. If the case is filed in a Wisconsin state court then you typically have three years to file a personal injury lawsuit, such as a pharmaceutical injury case. How class action settlements work. Settlements are complicated because of the number of plaintiffs involved. Find out how settlements work and what the potential benefits of a settlement may be for you. If you decide to proceed with a case, then you also need to know what happens next. A complaint will be filed in court against the pharmaceutical company that manufactured the drug or medical device. The pharmaceutical company will respond to the complaint and either deny the complaint or challenge the lawsuit. Both sides will engage in a discovery period during which information is gathered and shared as required. Motions may be filed in an attempt to resolve the lawsuit or seek rulings on evidence. A motion will be filed to certify the class action, and the case will proceed if approved. Notice is published or sent to members of the class action suit. The case is either tried or settled before trial. Of course, each pharmaceutical class action case is unique, and not every case will proceed in exactly this fashion. Your attorney will keep you up-to-date on developments in your case and fight hard to protect your rights. Accordingly, we encourage you speak with your lawyer and to find out more about what to expect in a pharmaceutical class action case if you’ve been hurt by a medical device or prescription medication. Posted on 10/27/2015Is Bair Hugger™ to Blame for Your Infection? Posted on 02/24/2014Injured After Testosterone Replacement Therapy?